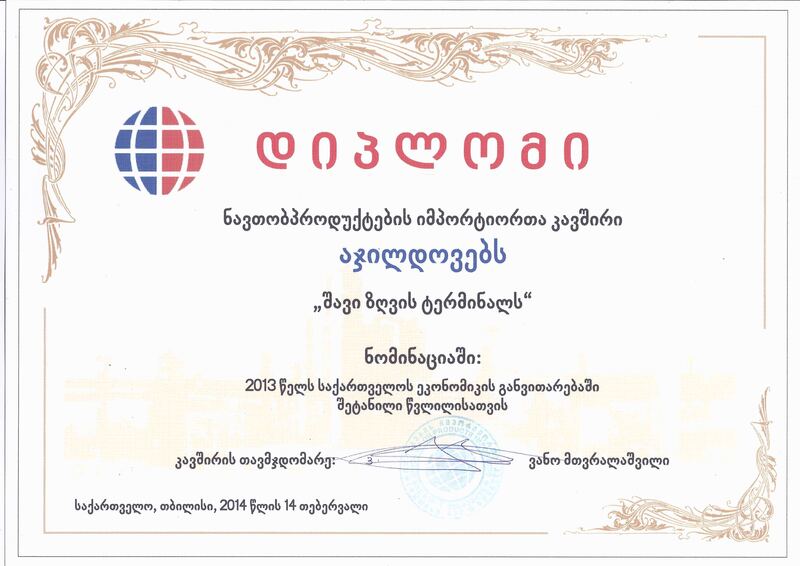 It is already been more than 23 years since The Georgian Times and the Georgian Opinion Research Business International (GORBI) conjointly began organizing the business rating awards ceremony and giving out awards for the best businessmen and companies from various fields of the economy. On November 10, the best-of-the-best were revealed and awarded at a ceremony held in Tbilisi. The participants of the ‘Investment Awards’ were also selected. Special prizes and certificates were handed-out to the participating companies and investors to symbolically show appreciation for their efforts, and stimulate their future contribution to the country’s economy. The festive event was attended by members of the Georgian government, including parliamentarians, accredited diplomatic corps, leading businessmen, Non-governmental organizations, as well as the local and foreign media. An event that summarized business sector results for the year 2013 was held by the Union of Oil Exporters on February 14, 2014. According to event organizer’s notice Mr. Vano Mtvralashvili, such business meetings have become a tradition. This was the ninth time this meeting was held. Based on the statistical data provided, the public was informed about the companies that have worked hard all year to contribute to the country's economy. Of paramount importance, were the paid amounts to the state budget, the investments made, and the number of people who were employed during the year. Representatives of government agencies, diplomatic missions, international and non-governmental organizations, Georgian oil companies, as well as foreign companies attended the event. Ministry of Regional Development and Infrastructure of Georgia Mr. David Narmania, as well as the Executive Director of the Chamber of Commerce and other notable figures in the business community presented diplomas and prizes to the winners of the major oil companies. Black Sea Terminal was awarded for the fifth time in the event’s existence. It received awards in various nominations. The company received the first award in 2009. This year’s award is especially important for our company, as we received it for our contribution to the development of Georgia’s economy. Obviously this is a key indicator for the determination of the efficiency level of the investments made by the company. Black Sea Terminal LLC transfers a considerable amount of money to the state budget, participates in various infrastructural projects, social programs, and has a big role in fulfilling the Employment Program supported by the Georgian Government. Black Sea Terminal is the one of the active members of a large family created by Azeri companies based in Georgia. As a result of BST’s cultural activity, the company has established and strengthened economic and political ties between the two neighboring countries. 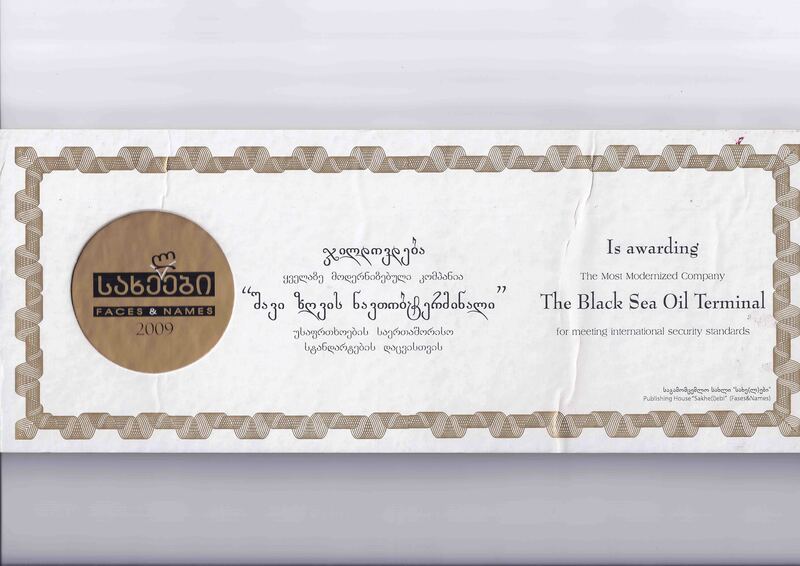 Black Sea Terminal LLC has been awarded with the Diploma of “The Oil and Oil Product’s Transshipment Marine Terminal with the Best Infrastructure” at the awarding ceremony, organized by the Union of Oil Products’ Producers, Importers and Consumers of Georgia in Tbilisi. 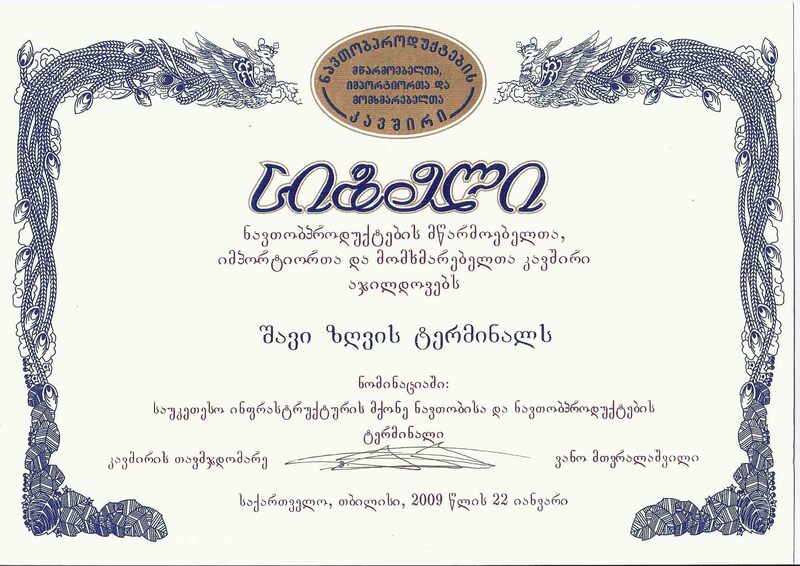 The awarding ceremony is traditionally held every year in the capital of Georgia and all oil companies operating in the country compete for the prizes in various nominations. As in previous years the Terminal succeeded in leaving behind all competitors and preserving the right to be called the Terminal with the best infrastructure. It should be noted that the Terminal has been winning this nomination four years in a row. This has been achieved through hard work, high discipline and great responsibility shown by BST staff. The Terminal will try to justify this high appreciation and continue developing its professional standards to high levels in the future. 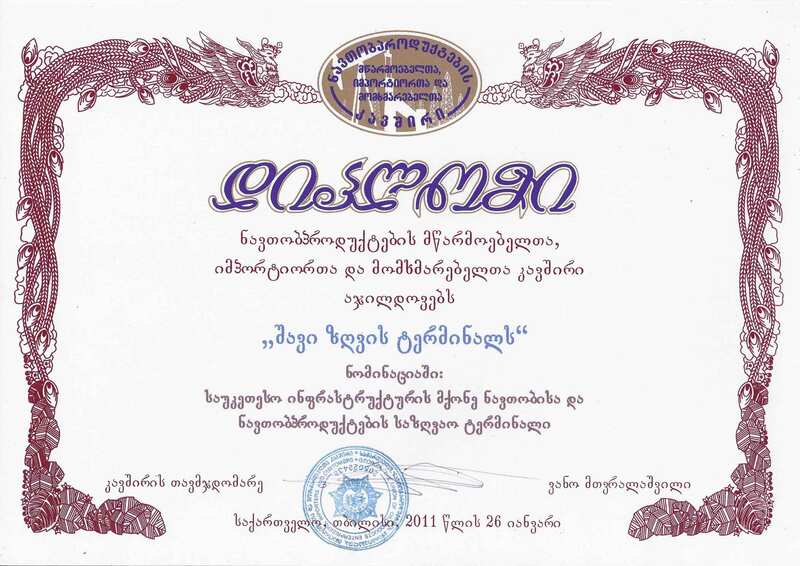 Yesterday, on the 26th of January, 2011, at the awarding ceremony, organized by Union of oil products’ producers, importers and consumers of Georgia, based on the results of 2010 Kulevi Oil Terminal was rewarded with the Diploma of “The Terminal with the best infrastructure”. It was mentioned, that on the Black Sea coast The Black Sea Terminal LLC is one of the leading companies of Western Georgia, which has achieved considerable success during last years. Kulevi Oil Terminal is being rewarded as “The Terminal with the best infrastructure” three years in a row. "Oil Terminal with the best infrastructure"
The Black Sea Terminal Ltd. was awarded with Diploma of "Oil & Oil Products Terminal with the Best Infrastructure 2010" for the second consecutive time. The awarding ceremony arranged by the Union of Oil Products Producers, Importers & Consumers took place in Courtyard Marriot Hotel on January 26, 2010. Union of Oil Products' Producers, Importers & Consumers of Georgia was founded in February 2004 and since 2004 has performed events to name and give award to the companies on the oil products market of Georgia which made the biggest contribution in the country’s infrastructure development and also for some other nominations. Kulevi Oil Terminal (Black Sea Terminal) began his activity in May 2008. Terminal has successfully passed certification by Moody International on standards ISO 9001 (management quality), ISO 14001 (environment protection management) and OHSAS 18001 (safety of production and industrial works). Multimode transshipment capacity of Kulevi terminal is 10 million tons of oil products by year, including 3 million tons of oil and diesel fuel and 4 million tons of black oil. Overall storage capacity of Tank Park is 320 000 m3 with the prospect of increase up to 380 000 m3. For loading operations there are two berths for receiving tankers with tonnage up to 100 000 tons. Loading performance is from 1000 to 8000 m3/h. The Terminal has its own Railway station, where 180 oil tank cars can be placed for discharging. The trestles make possible the simultaneous discharge of 168 oil tank cars. Earlier The Kulevi Oil Terminal has won the prize “The most modernized Oil Terminal in Georgia for complying with international safety standards” founded by Georgian magazine “Sakhelebi” (Names) on. 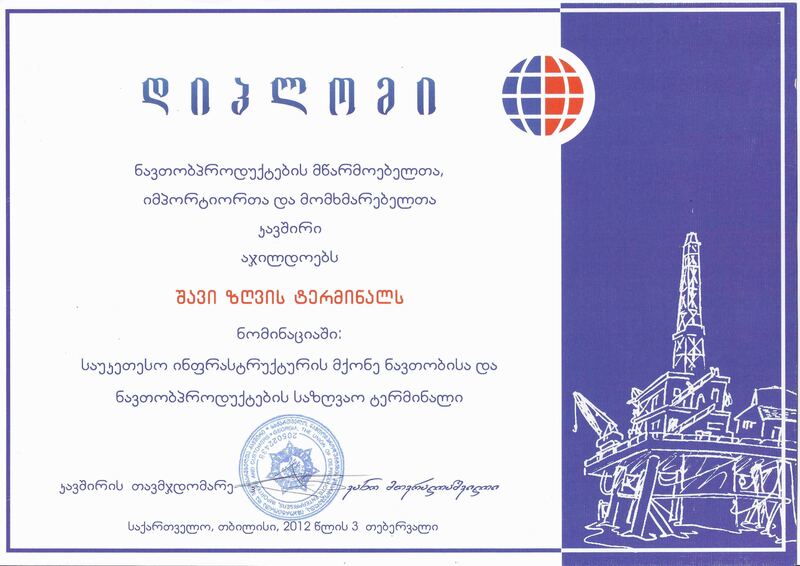 On January 19, 2010 Georgian magazine “Sakhelebi” (Names) awarded Kulevi Oil Terminal as “The most modernized Oil Terminal in Georgia for complying with international safety standards”. The presentation ceremony took place at Courtyard Marriott Hotel in Tbilisi. 32 companies and outstanding figures have been awarded in total. 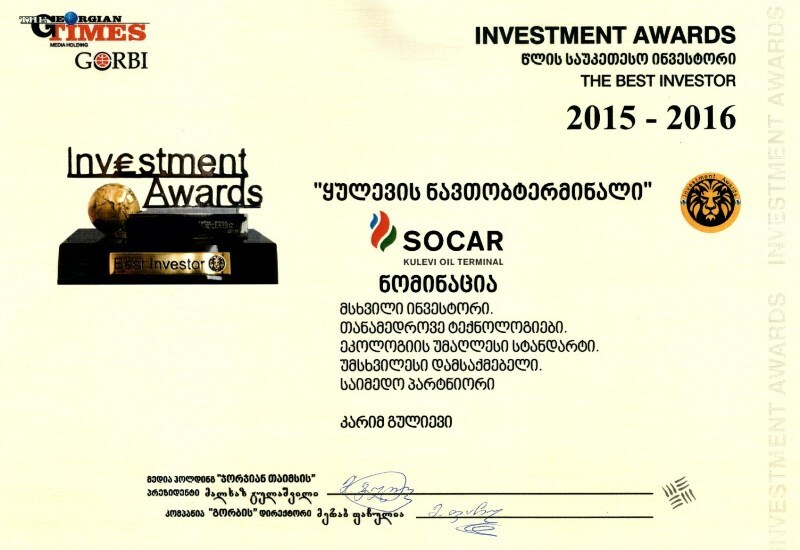 SOCAR has been honored by magazine “Sakhelebi” as The “Most Successful Company of the Year”. SOCAR is represented in Georgia by “SOCAR Energy Georgia” established as SOCAR’s commercial company in Georgia in 2006. “SOCAR Energy Georgia” LTD’s activity includes retail and bulk realization of fuel in Georgia, importing of petroleum and liquid gas. 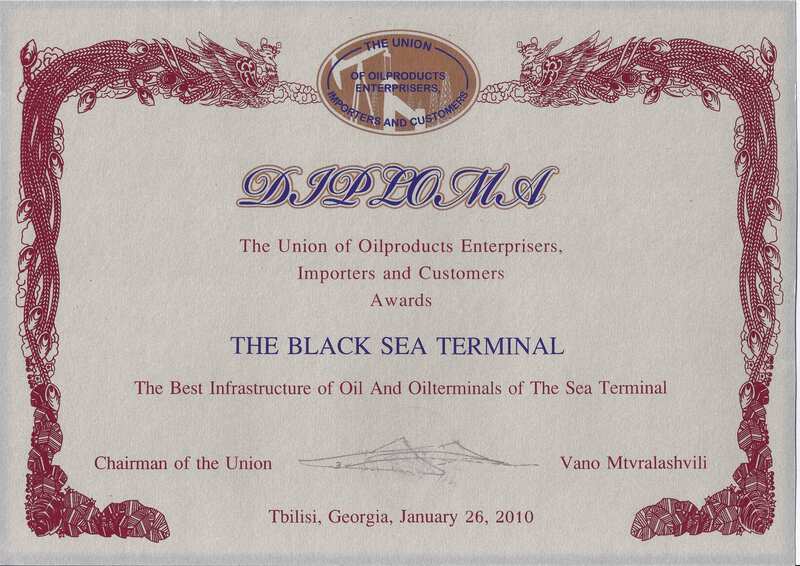 On the 22nd of January, 2009 at Rewarding Ceremony of "Union of Oil Products' Producers, Importers & Consumers" the Black Sea Terminal Ltd. was honoured with Diploma of "Oil & Oil Products' Terminal with the Best Infrastructure".